The loss of viability of wine yeast strains due to low-temperature fermentations could be overcome by increasing their stress tolerance and adaptability. Changes in membrane lipid composition are one of the first responses to cold stress. The aim of this study was to analyze the various adaptation mechanisms to low temperatures by comparing the better adapted Saccharomyces species. The viability, vitality, fermentation capacity, and lipid composition of different Saccharomyces species (S. cerevisiae, S. bayanus, S. uvarum, and a hybrid S. cerevisiae/S. 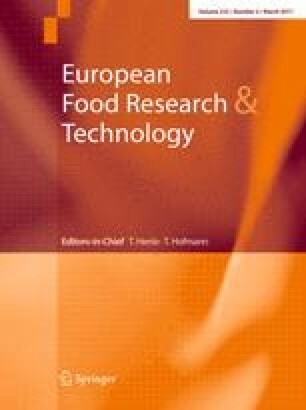 uvarum) with different fermentative origins (wine, beer, and baker’s strains together with a laboratory strain) were compared after culturing at low (13 °C) and optimal (25 °C) temperatures. In spite of specific responses of the different strains/species, the results showed that at low temperature, the medium-chain fatty acid and the triacylglyceride content increased, whereas the phosphatidic acid content and the phosphatidylcholine/phosphatidylethanolamine ratio decreased. Only the laboratory strain was not able to ferment the sugars, and after growing at both temperatures, its lipid composition was very different from that of the other strains. The hybrid strain showed the highest sugar consumption at 13 °C and the best vitality whatever the preculture temperature used. The rest of the species needed a preadaptation at low temperature involving a change in their lipid composition to improve their fermentation rate at 13 °C. This work was financially supported by a grant from the Spanish government (AGL2007-65498-C02/ALI). Saccharomyces uvarum PJP3 and the hybrid S. cerevisiae/S. uvarum 14a were kindly supplied by Prof. Isabelle Masneuf-Pomarède, ENITA of Bordeaux (France). The commercial baker’s strain Plus Vital was also kindly supplied by Dr. Francisca Rández from the IATA (CSIC). The authors would also like to thank the Language Service of the Rovira i Virgili University for checking the manuscript.